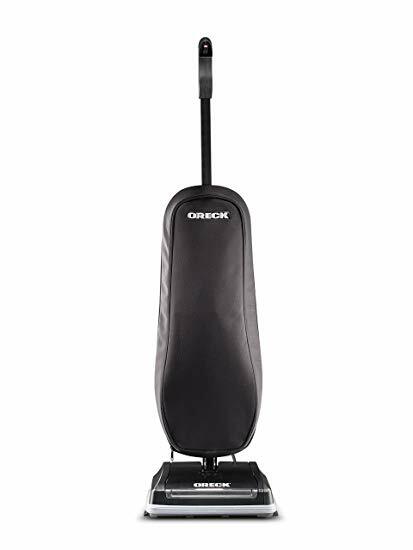 The Oreck® Classic Heritage upright vacuum delivers a superb cleaning power backed by Oreck’s reputation for durability. This lightweight, 1-speed vacuum features Oreck’s direct suction design which delivers dirt in a straight, efficient path right to the vacuum bag, It’s a streamlined design that works beautifully with a small motor and one of the reasons that Oreck bagged uprights are so lightweight—as well as powerful. The Classic Heritage comes with a 3-year limited warranty. The last vacuum cleaner I bought was a bagless Hoover Wind Tunnel canister. I thought I wanted to go bagless, because I am notoriously "careful" with my money (i.e., cheap) and I knew I wouldn't want to buy bags. But my strategy backfired -- having to dump out the bin and clean the filter after every use means that I don't vacuum very much. What a dirty, dusty business that is! So... here I am with my bagged Oreck. It's easy to operate -- just an on/off switch, and a touch of the foot to angle the handle down. The best thing about it is that it is indeed lightweight. I vacuum on two levels, and the Hoover is a bear to heft up and down stairs. I can even vacuum the stairs with the Oreck, juggling it with both arms, although I feel a little like Arnold Schwarzenegger. Suction is pretty good, although I notice that it couldn't handle some bigger and heavier items (e.g., bits of paper, a splinter of wood). Also, because of the single speed, I don't plan to use it on my antique wool rug. The Hoover has a gentle low speed. The Oreck's cord is really long, which I like because I can do several rooms without pulling the plug. But I do have to wrap the extra cord around my hand sometimes to keep the vacuum from going over it.